This morning was dark and gloomy, and when the rain finally came it felt like morning had never happened, we were cast right back into the night. But the sun eventually came out, and I walked to the bank and cashed a savings bond I’ve had for thirty years, and I went to the magical used book store across the street, which always has exactly what you want when you want it, to buy a biography of Jean Vigo. Jean Vigo made four films, and he died at the age of 29 in 1934. A lot has been written about Jean Vigo, and I don’t have much intelligent film criticism to add, or any revelatory biographical details, so I’ll just tell you why I’d like to meet him. Holden Caulfied said that he knew he loved a book when he wanted to write a letter to the author once he’d finished it. I know I love a film when I want to sit with the auteur over a glass of wine, and talk about film, and plan our next shoot. I feel that way about Vigo more than any other director I can think of. Vigo worked in a partnership with cinematographer Boris Kaufman (brother of Dziga Vertov). Kaufman described filming with Vigo, even in physically harsh conditions with little time and money, as “Cinematic paradise.” Apparently Vigo was demanding but kind and very funny. I love to think about their friendship. I imagine that Kaufman was precise and technically skilled, and Vigo was vague and anarchic, but somehow they inspired each other, they found a balance to shoot wild, emotionally beautiful, beautifully filmed scenes. I’d like to be friends with them, too. I believe that people have different kinds of intelligence. The other night, in a half-awake state, I aligned these with the elements. Some have a practical, earthy intelligence; some have a fiery and passionate intelligence that’s focussed and burns very bright; some have an airy and intellectual intelligence, far-reaching and dry. And some have a watery intelligence, vague, changing, emotional. Of course, most people have some combination of these, but for me, personally, it’s mostly watery. Jean Vigo’s films are beautifully watery. Literally, in most cases–A propos de Nice is set by the sea, Tari, Roi de L’eau is a portrait of a simmer, and L’atalante takes place on a barge. And they also have a fluid, luminous quality, like light through water, stylistically and emotionally. Like water, they follow exactly the path they’re supposed to follow, along the river bank or surging to the shore, but they’re riotous and unexpected, too, and spill out over anything that attempts to restrict them or tie them down. Vigo has been called one of the early advocates of poetic realism. And it’s true that his films are a delightful combination of near-documentary prosody with beautiful flights of fancy and dream-like forays into characters’ imaginations. But he shows imagination and poetry as an essential part of reality, not a departure from it, and so I believe it is. We spend at least half our lives dreaming, and we only understand the world as we filter it through the strange web of our own minds. Vigo’s very ordinary characters are fascinating and lovely because he gives us a glimpse into the beautiful chaos of their thoughts and desires. We see the every day cruelty and kindness of school children and their small moments of freedom and rebellion; we see the day-to-day life of a couple of newlyweds, and we watch as they pull apart and come together, as they lose each other and find each other, and grow to know and love one another. They’re drowning with longing, and confusion and desire have never been so beautifully rendered, or with such humor and honesty. Vigo’s films have such simplicity and grace, such sincerity and soul, but they’re also deeply political, even revolutionary. In watching them we see an uncanny representation of the world as it is, if only we’d take the time to notice–wild, unruly, unfair, mundane, magical, and deeply, abidingly beautiful. I made donuts! I’ve been thinking about it a while–Malcolm and I had some schemes in place. Yesterday, I just made some! I wanted to bake them, because I don’t like the smell of my kitchen after I fry something. Funnily enough, I’d spilled some butter in the oven the day before, so when I baked these the kitchen filled with smoke. Sigh. 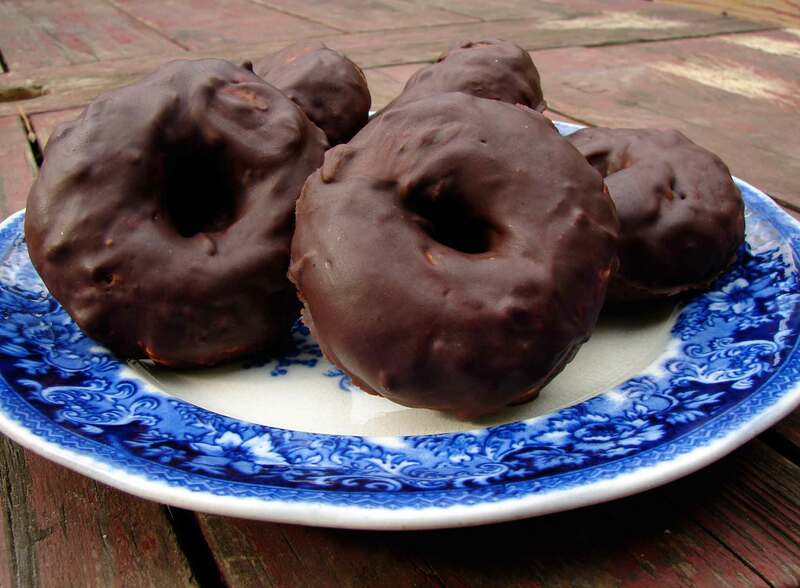 I adapted the recipe from a couple of old mennonite recipes (although their donuts were fried.) The resulting donut is quite dense and sweet-biscuity, but I believe this must be how donuts were intended to turn out, because they’re absolutely perfect for dunking in coffee. The chocolate melts, the donut softens, and then, as David says, you want more! I just bought some almond essence, after resisting for years. I resisted because I was semi-obsessed with it as a child, and put it in everything. Well…I am once again putting it in everything! It was nice here, though. It made the donut interesting without adding too much texture or craziness. You could replace it with cinnamon or lemon zest or any kind of flavoring you like. Or just leave it out altogether. Here’s the theme from L’atalante by Maurice Jaubert, another of Vigo’s lifelong collaborators. Add the dry ingredients and beat until well mixed. You should have a stiff, soft dough. Lightly butter a baking sheet. Break the dough into 6 pieces. Roll each piece into a smooth ball. Flatten, and poke a hole in the middle, pulling outward till you have a donut shape. Place each on the sheet, leaving a little space. Bake for ten to fifteen minutes, until they’re firm to the touch and golden on the bottom. Let cool. Melt the chocolate in a small saucepan over a larger saucepan of boiling water. Don’t let any water splash into the chocolate or it will seize up. When the chocolate is melted, stir in the butter. My chocolate thickened up at this point, but don’t worry! Warm the milk in a small saucepan, and pour it into the chocolate chips, stir till you have a smooth consistency. Spread tin foil on a baking sheet. Drop each donut into the melted chocolate, turn it over, take it out, shake off the excess chocolate and place on the foil lined sheet. Put in the fridge to chill until the chocolate sets. Then eat! Very good dunked in coffee. This entry was posted in cake, chocolate, dessert and tagged almond donuts, baked donuts, baked doughnuts, chocolate covered donuts, Jean Vigo, l'atalante, zero for conduct by Claire. Bookmark the permalink. Pingback: Day-Old-Doughnut Coffee Cake » Make It Like a Man!